Christian is the son of a Native American mother, who is of the Penobscot nation and grew up on a reservation in Maine. Christian's mother is a breast cancer survivor and he has campaigned to raise money for breast cancer research. From 2010–2015, Christian played Mike Montgomery, the younger brother of Aria Montgomery, on the Freeform television series Pretty Little Liars. Other acting credits include appearances on television series True Blood, Grey's Anatomy and Back to You with Laura Marano, and in the 2011 film Kill the Irishman. Christian starred in the 2013 film The Starving Games, a parody of The Hunger Games films. 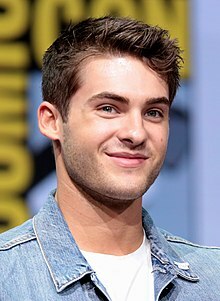 He appears in seasons 5 and 6 of the MTV series Teen Wolf, playing a recurring character named Theo Raeken, a former human who was turned into a hybrid creature called a Chimera, in his case, possessing both Werewolf and Werecoyote powers. 2007 Back to You Xander Tucker Episode: "Gracie's Bully"
2008 True Blood Screaming Boy Episode: "Sparks Fly Out"
2010 Grey's Anatomy Brad Walker Episode: "State of Love and Trust"
2012 Lab Rats Kavan Episode: "Crush, Chop, and Burn, Part I"
2012 Body of Proof Greg Lux Episode: "Home Invasion"
2013 Austin & Ally Elliot Episode: "Campers & Complications"
2013 Supah Ninjas Flint Forster Episodes: "Flint Forster", "Finding Forster", "Spring Fling"
2014 See Dad Run Evan Episode: "See Dad Roast the Toast"
^ a b c "Codie Christian". Hollywoodlife. Retrieved July 1, 2016. ^ Codie Christian [@ReallyCody] (April 15, 2015). "THANK YOU ALL SO MUCH FOR THE BIRTHDAY WISHES. I'm truly humbled and have no idea how to express my gratitude" (Tweet). Retrieved July 1, 2016 – via Twitter. ^ Avery Thompson (August 24, 2015). "'Teen Wolf' Finale: Game-Changing Reveals, Theo & Malia's 'Connection' & More Scoop". Hollywoodlife. Retrieved August 31, 2015. ^ Andre (May 31, 2018). "New Show "All-American" this fall on The CW". Cody Christian.co. Retrieved July 31, 2018. ^ Cody Christian (August 19, 2014). "Cody Christian Tweet". Twitter. Retrieved August 8, 2017. ^ Ashley Bohall (November 19, 2016). "Ashley Bohall Tweet". Twitter. Retrieved August 8, 2017. ^ Brie Hiramine (March 24, 2016). "<3: Cody Christian Writes a Beautiful Message About Mom's Struggle With Breast Cancer". J-14. Retrieved August 8, 2017. ^ Cody Christian (September 9, 2015). "Cody Christian Tweet". Twitter. Retrieved August 8, 2017. ^ Andy Swift (November 8, 2013). "'The Starving Games': Cody Christian Previews His Twisted Take On Peeta". Hollywoodlife. Retrieved July 10, 2015. ^ Megan Vick (February 10, 2015). "'Teen Wolf' brings 'Pretty Little Liars'' Cody Christian into the pack". Zap2it. Retrieved July 1, 2016. ^ Julianne Ishler (February 10, 2015). "Cody Christian In 'Teen Wolf': 'Pretty Little Liars' Hunk Joins 5th Season". Hollywoodlife. Retrieved July 10, 2015. ^ Borys Kit (October 23, 2013). "'Pretty Little Liars' Actor Cody Christian, Tim Daly Join Indie Thriller 'Submerged'". The Hollywood Reporter. Retrieved July 10, 2015. ^ Nellie Andreeva (January 18, 2012). "Five Cast In NBC Pilot 'Beautiful People'". Deadline Hollywood. Retrieved July 1, 2016. Wikimedia Commons has media related to Cody Christian. This page was last edited on 15 April 2019, at 16:11 (UTC).